..... A longeron runs on each side of the cockpit forward from the Seatback Bulkhead to the instrument panel. These longerons are made of 5/8" square wood and must first be bowed to shape in order to fit the curvature of the fuselage side. .....Support the longerons on each end and place weights in the middle, as shown. Permit them to stand this way for at least two days. The wood should bow in the center after a short while. If you wish to be very scientific, you may measure the amount of bow required by skipping ahead and checking the curvature on the fuselage sides where the longerons will be mounted. 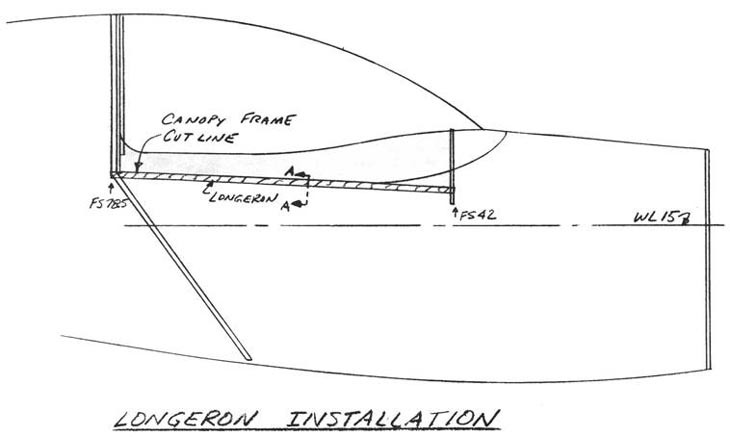 ..... Once the canopy frame has 'been cut out and the longerons bowed statica11y, then they should be mounted in the fuselage to increase the strength of the fuselage. 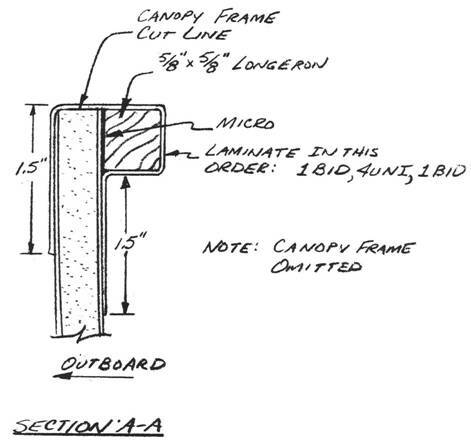 The sketch included here shows the location of the longerons; note that they basically go just below the canopy frame cut out line. The longerons must be installed as shown here in order for the canopy hinges to be positioned correctly. .....Also note the 4 UNI glass and 2 BID glass used to mount the longerons, in addition to the flox. These tapes significantly increase the stiffness of the longeron, and must be lapped onto the fuselage a minimum of 1.5 inches. The UNI orientation is alonq the longeron; the BID is laminated at 45 degrees to the longeron line. Do not use micro between the lamination and wood.